Heat pump hot water systems utilise a system similar to a reverse air conditioner to draw the ambient warmth in the air to heat the water for your home. These highly energy efficient units provide an easy, environmentally friendly upgrade from a conventional electric hot water system, potentially reducing your hot water bills by up to 30%. Brisbane Plumbing and Drainage team can supply, install and repair heat pump systems throughout Brisbane city and suburbs. Heat pumps are a practical renewable energy water heating option for homes without suitable roof space to house the solar panels for a solar hot water system. Brisbane’s warm temperate climate is ideal to get the most out of your system, reducing the frequency with which the booster is needed. 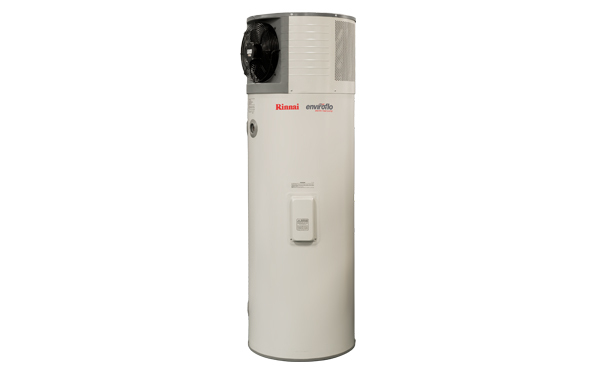 Heat pump water heaters are available in an all-in-one integrated model or split system units which allows you to install the water tank on one place and the compressor out of the way. Especially important if you live in an area where noise could be an issue. Purchase costs for heat pump units can be higher than other types of systems at the moment but that is more than offset by the reduction in running costs over time and the government rebates available to homeowners. To encourage residents and small businesses to invest in sustainable energy the Australian Government are offering Small Scale Technology Certificates to those who purchase items like solar PV systems, solar and heat pump hot water systems. These certificates are usually used to help reduce the purchase price of the unit. Hot water system breakdowns don’t always happen during business hours, in fact, more often than not they stop working halfway through the weekend, leaving homes without hot water for extended periods. Our 24 hours plumbers provide emergency hot water repairs throughout Brisbane, minimising downtime and the inconvenience it causes. Brisbane Plumbing and Drainage can take care of all your heat pump hot water system requirements, contact our team on 1300 740 206 or complete our quick hot water booking form today.